All transactions are safe and secure with a reliable history in online purchasing behind each of our associates. 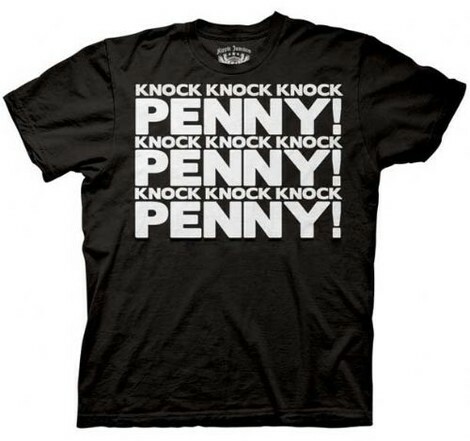 Buy the Penny Knock Knock t-shirt to own Big Bang Theory clothing and merchandise. "'Knock Knock Knock' Penny! 'Knock Knock Knock' Penny" Sheldon repeats this until his neighbor across the hall answers her door. In one instance he humorously continues knocking after Penny opens the door. This interaction has inspired fans to create montage videos on YouTube of all the times that Sheldon knocks on Penny's door. If you find Sheldon and Penny's interactions humorous, then add this The Big Bang Theory t-shirt to your wardrobe. Other great BBT clothes include the Rock Paper Scissors Lizard Spock shirt. Pick your favorite merchandise item to let everyone know you're a fan. In addition to the Penny Knock Knock tee above, browse the Big Bang Theory Clothing Gallery for more apparel like men's and women's clothes, kids shirts or hoodies.